Sometimes love needs to be expressed boldly to make sure the opportunity doesn’t slip through your fingers, as our next interviewees Romain and Drue can attest to. Drue and I first met on Saint Patrick’s day in 2009! In Atlanta, GA this where the story of the real Fado starts. She was wearing green and I was wearing Red! Why Red, you must ask? Well I was actually working the St. Paddy’s event at Fado’s bar in Buckhead raising money for our rugby club. I was a freaking doorman… so had to stand out and do my job to not let anyone pass me thru the exit door. Then, there all the sudden comes 5’4 Drue trying to sneak in thru the exit door because the entry line was too long. Well she stood no change getting pass this (stud) so I turned her around like a jerk. Half an hour later, miss P showed up to my doorsteps 😉 looking up at me and nagging, flirting with Mr. red shirt doorman. As she was with her friends, I would catch myself staring at her aura, glow and smile from across the room. She’d come by from time to time to crack a joke, laugh and make fun of my accent. Few hours passed and my shift was home, it was time for me to hit the floor and find that blonde southern bell! After a lap or two around the bar, I caught her smile across the bar. She was with one of her friend who was talking to one my rugby friend, so this was my time to shine and make a move. So I slowly walked over to her, sneaked up from behind and stole a kiss from her!! That was all I had been thinking about the last few hours during my shift. And from there she had her first French kiss and the rest was history. I knew Drue was the one when she fully let me into her life, when I got to meet her warm and loving southern family. They made me feel like I was one of them. Even though I had fallen for Drue and knew she was the one, I did not let her know or express those emotions with her until we were further along into our relationship. I didn’t want to get hurt, I just wanted to make sure she was all in too and in it for the long run with me. I remember many instances where I would’ve gotten on one knee for Drue, but there was two particular instances which I couldn’t forget. I was overwhelmed with emotions and joy at these moments, once was during a stroll at sunset during one of our little weekend gateways on the beaches of Boca Raton, FL her beach hair, tan and beautiful glowing blue eyes when I stopped her there during our walk to express how happy I was with her, how much I cared for her and how good she’d make me feel inside. Our proposal was over an early fall morning, in Austin, Texas. I woke Drue up at 5am and told I had something fun planned out for her this morning but couldn’t elaborate on the surprise and our activity. Let’s just say Drue isn’t too keen of the unknown and surprises. We got in the car and drove about 25 minutes outside of Austin, at the last mile I blind folded Drue. Pulled up to an open field, got her out of the car and slowly started walking down the field where I then stopped Drue still and go myself on one knee, she was unfolded by a crew member to me on a knee holding the stunning Diamond Reserve custom engagement ring and a 100 feet tall Hot Air Ballon behind me!! So, she said OUI!!! P.S. 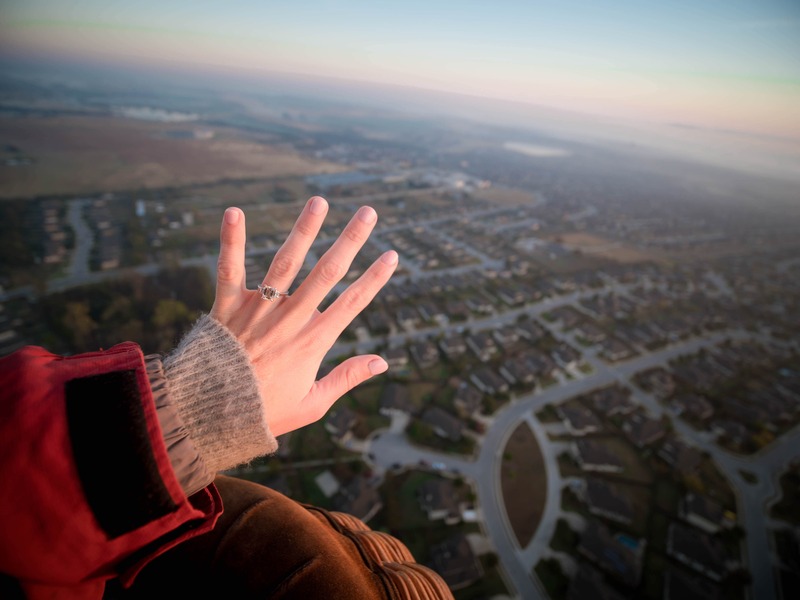 Planning a Hot Air Balloon proposal is a whole lot more difficult then it sounds. Our ring from the Diamond Reserve is the most special piece we own, the customization process with Kaeleigh was delightful and fun and being able to have a touch of our own thoughts and creation makes it that much special. It is truly stunning and Drue gets compliments everyday on the ring. We love the ring!! Needless to say, we got all dolled up and headed to the bar to meet our friends. At some point, in the midst of dancing on the dance floor, I got separated from the group (most likely in search for an Irish O-bomb) and upon trying to get back into the dance room, this tall guy in red (eating an APPLE) stopped me and said I could not enter through this door. Uh, skurrr, nobody tells Drue “no”. The audacity!! Obviously, this roadblock didn’t stop me on my mission to crank that soulja boy up on the dance floor. The tall apple-eating, weird talking, boy kept eying me… and my dance moves. As the night came to end, me and some girls were getting ready to leave when someone grabbed me from behind and kissed me. I can honestly say I’ve never met a man as BOLD as Romain. He still amazes me to this day. I never really was one to believe in “the one.” But what I quickly learned about Romain was that he was most certainly ONE of a kind. There was no other person in this world like him. He made me laugh uncontrollably, he wrote me love notes (and raps ), he was always full of surprises, kept me on my toes, and filled me days with lots of handpicked sun flowers. No matter how fearful I was of love or of finding “the one” he effortless made a one of a kind imprint on my heart. I’m so happy that I get to share my heart with him forever. We went to Austin for my 29th birthday. On Sunday we spent the entire day/evening bar hopping. The night ended up with me dancing on the bar at the coyote ugly saloon. Thankfully our hotel was just across the street because one two many peppermint schnapps (what were we thinking??) and I was puking. I slept with my head in the trash can – classy. 4:30 in the morning rolls around and there’s a knock at the door, it’s room service. Romain told me to get ready because we had to be somewhere by 6. He blind folded me, drove for what seemed like hours, into a wet field. I was so nervous I was shaking. He let go of my hand and I remember being so scared. I didn’t know what was about to happen and my mind was racing. Some rando came behind me and began to untie the blind fold. 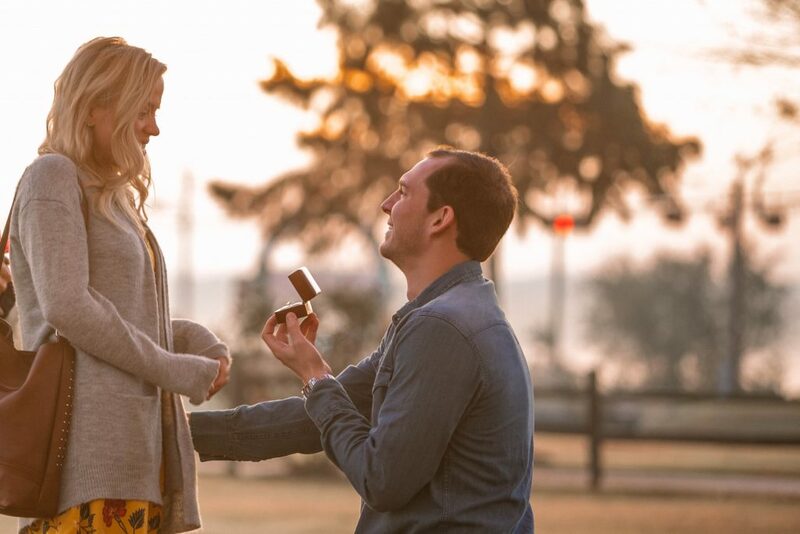 At this point I started to laugh because I was like “seriously, this man is about to murder me… in a dewey field.. at 6am..in Texas.. at the age of 29.” But upon opening my eyes, I saw my love down on one knee with tears in his eyes. He couldn’t speak so I just said OUI! 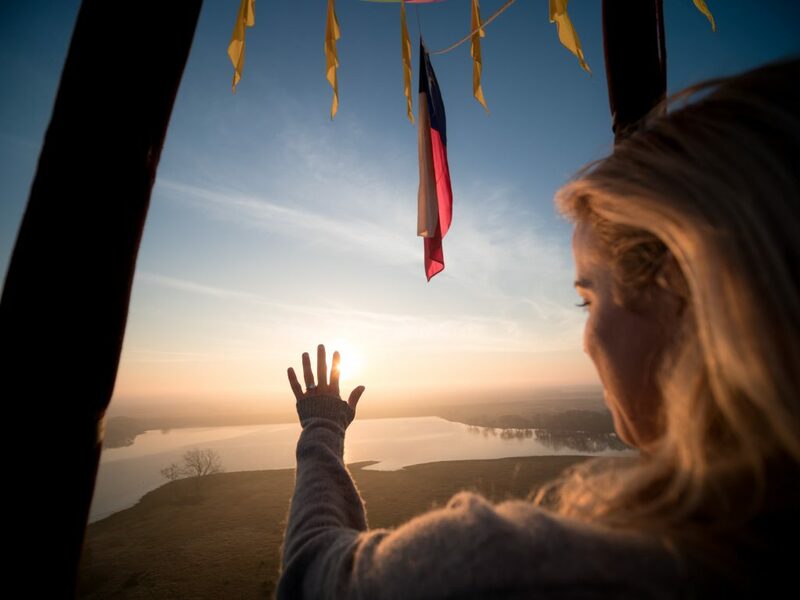 And we went up in a hot air balloon to watch the the sun rise. Magical. Before we got engaged, we would talk about different ring styles. He was very inquisitive about what I liked and wanted to make sure I had the perfect ring. Truthfully, I didn’t really like anything. I’d see really pretty rings on my friends, they’d let me try it on and just nothing looked good on me. I knew that I wanted something timeless and romantic and something that he created on his own, a piece of jewelry that had a story to it. So happy that he found Kaeleigh at TDR because I absolutely adore my ring. I get so many compliments and I know that it makes him feel so proud of his creation.